A zinc–carbon battery is a dry cell primary battery that delivers about 1.5 volts of direct current from the electrochemical reaction between zinc and manganese dioxide. A carbon rod collects the current from the manganese dioxide electrode, giving the name to the cell. A dry cell is usually made from zinc which serves as the anode with a negative electrical polarity, while the inert carbon rod is the positive electrical pole cathode. General purpose batteries may use an aqueous paste of ammonium chloride as electrolyte, possibly mixed with some zinc chloride solution. Heavy duty types use a paste primarily composed of zinc chloride. Zinc–carbon batteries were the first commercial dry batteries, developed from the technology of the wet Leclanché cell. They made flashlights and other portable devices possible, because the battery can function in any orientation. They are still useful in low drain or intermittent use devices such as remote controls, flashlights, clocks or transistor radios. Zinc–carbon dry cells are single-use primary cells. Old 3V zinc–carbon battery, ca. 1960, with cardboard casing. By 1876, the wet Leclanché cell was made with a compressed block of manganese dioxide. In 1886 Carl Gassner patented a "dry" version by using a zinc cup as the anode and a paste of plaster of Paris (and later, wheat flour) to jellify the electrolyte and to immobilize it. In 1898 Conrad Hubert used consumer batteries manufactured by W. H. Lawrence to power what was the first flashlight, and subsequently the two formed the Ever Ready battery company. In 1900 Gassner demonstrated dry cells for portable lighting at the World's Fair in Paris. Continual improvements were made to the stability and capacity of zinc–carbon cells throughout the 20th Century; by the end of the century the capacities had increased fourfold over the 1910 equivalent. Improvements include the use of purer grades of manganese dioxide, better sealing, and purer zinc for the negative electrode. Zinc chloride cells (usually marketed as "heavy duty" batteries) use a paste primarily composed of zinc chloride, which gives a longer life and steadier voltage output compared with ammonium chloride electrolyte. Side-reactions due to impurities in the zinc anode increase self discharge and corrosion of the cell. Formerly, the zinc was coated with mercury to form an amalgam, protecting it. Since this is an environmental hazard, current production batteries no longer use mercury. Manufacturers must now use more highly purified zinc to prevent local action and self-discharge. As of 2011 zinc-carbon batteries accounted for 20% of all portable batteries in the UK, and 18% in the EU. In Japan they account for 6% of primary battery sales. The container of the zinc–carbon dry cell is a zinc can. The can contains a layer of NH4Cl or ZnCl2 aqueous paste impregnating a paper layer that separates the zinc can from a mixture of powdered carbon (usually graphite powder) and manganese (IV) oxide (MnO2) which is packed around a carbon rod. Carbon is the only practical conductor material because every common metal quickly corrodes in the positive electrode in salt based electrolyte. Cross-section of a zinc–carbon battery. Early types, and low-cost cells, use a separator consisting of a layer of starch or flour. A layer of starch-coated paper is used in modern cells, which is thinner and allows more manganese dioxide to be used. Originally cells were sealed with a layer of asphalt to prevent drying out of the electrolyte; more recently a thermoplastic washer sealant is used. The carbon rod is slightly porous, which allows accumulated hydrogen gas to escape while retaining the aqueous electrolyte. The ratio of manganese dioxide and carbon powder in the cathode paste affects the characteristics of the cell; more carbon powder lowers internal resistance, while more manganese dioxide improves storage capacity. Flat cells are made for assembly into batteries with higher voltages, up to about 450 volts. Flat cells are stacked and the whole assembly is coated in wax to prevent electrolyte evaporation. The battery has an electromotive force (e.m.f.) of about 1.5 V. The approximate nature of the e.m.f is related to the complexity of the cathode reaction. 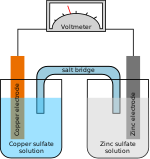 The anode (zinc) reaction is comparatively simple with a known potential. Side reactions and depletion of the active chemicals increases the internal resistance of the battery, which causes the e.m.f. to drop under load. The zinc chloride cell, frequently referred to as a heavy-duty, extra-heavy-duty, or even super-heavy-duty battery, is an improvement on the original zinc–carbon cell, using purer chemicals and giving a longer service life and steadier voltage output as it is used and offering about twice the service life of general purpose zinc–carbon cells, or up to four times in continuous-use or high-drain applications. This is still a fraction of the output of an alkaline cell. Alkaline batteries offer up to eight times the battery life of zinc chloride batteries, especially in continuous-use or high-drain applications. Manufacturers recommend storage of zinc–carbon batteries at room temperature; storage at higher temperatures reduces the expected service life. While batteries may be frozen without damage, manufacturers recommend that they be returned to normal room temperature before use, and that condensation on the battery jacket must be avoided. By the end of the 20th century, the storage life of zinc–carbon cells had improved fourfold over expected life in 1910. This picture shows the zinc container of fresh batteries at (a), and discharged batteries at (b) and (c). The battery shown at (c) had a polyethylene protection film (mostly removed in the photo) to keep the zinc oxide inside the casing. Progressive corrosion of zinc–carbon batteries. Thousands of tons of zinc–carbon batteries are discarded every year around the world and are often not recycled. Disposal varies by jurisdiction. For example, in the U.S, the state of California considers all batteries as hazardous waste when discarded, and has banned the disposal of batteries with other domestic waste. In Europe, battery disposal is controlled by the WEEE Directive and Battery Directive regulations, and as such zinc-carbon batteries must not be thrown out with domestic waste. In the EU, most stores that sell batteries are required by law to accept old batteries for recycling. Disassembled zinc chloride cell (similar to zinc carbon cell). 1:entire cell, 2:steel casing, 3:zinc negative electrode, 4:carbon rod, 5:positive electrode (manganese dioxide mixed with carbon powder and electrolyte), 6:paper separator, 7:polyethylene leak proof isolation, 8:sealing rings, 9-negative terminal, 10-positive terminal (originally connected to carbon rod). ^ a b c d e f g h Linden, David; Reddy, Thomas B. (2002). "8". Handbook of batteries. McGraw-Hill. ISBN 978-0-07-135978-8. ^ INOBAT 2008 statistics Archived March 25, 2012, at the Wayback Machine. ^ "Put a charge into your battery savings". Chicago Tribune. 2015-04-29. Retrieved 2015-06-19. ^ "Zinc Chloride Batteries". Radio Shack. Archived from the original on 2015-02-12. Retrieved 2015-06-19. ^ "Batteries". Waste Prevention Information Exchange. California Department of Resources Recycling and Recovery (CalRecycle). Retrieved 5 September 2012. Wikimedia Commons has media related to Zinc-carbon batteries.